Singer Justin Bieber has signed on with suborbital spaceship company Virgin Galactic to take a trip to space. 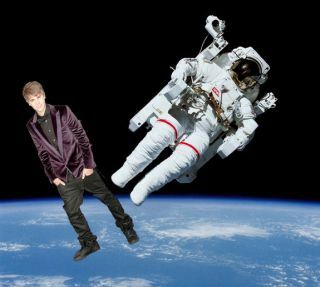 Justin Bieber is going to space, and he may even shoot a music video in the final frontier. The teen pop star is the latest celebrity to sign up for a suborbital flight to the edge of space aboard Virgin Galactic's SpaceShipTwo, joining actors Angeline Jolie, Ashton Kutcher and Leonardo DiCaprio. Bieber responded with an idea whose seriousness is tough to gauge. "@richardbranson @scooterbraun @virgingalactic let's shoot a music video in SPACE!! #nextLEVEL," the pop star tweeted to his more than 40 milion Twitter followers. Seats aboard the six-passenger SpaceShipTwo currently sell for $250,000. To date, more than 600 people have put deposits down to reserve a spot, according to Virgin Galactic's website. However, the space plane hasn't launched anyone to space just yet — it's currently in the testing phase, with crewed flights expected to begin by the end of this year. SpaceShipTwo is designed to fly to suborbital space and back, not make a full trip around the Earth. Passengers will experience several minutes of weightlessness and see the curvature of our planet's limb against a black sky, Virgin Galactic officials say. The spacecraft made its first rocket-powered test flight in April and should begin commercial operations soon, officials say. Branson has said he and his family will be aboard th vehicle's landmark maiden voyage to space. SpaceShipTwo is the successor to SpaceShipOne, a smaller test vehicle that won the $10 million Ansari X Prize in 2004 for becoming the first private manned spacecraft to carry people to space and back twice within the span of two weeks. Virgin Galactic isn't the only game in town when it comes to commercial suborbital spaceflight. XCOR Aerospace is developing a one-passenger space plane called Lynx, which may be up and running around the same time as SpaceShipOne.